If you hear the scurrying of little feet around your attic or crawlspace, your first dreaded thought is probably that you have mice, or—even worse—rats. If this situation sounds familiar, keep reading. We've got just the solutions you need for how to deal with this type of scenario...and don't worry—it's more common than you think! Your very first step in handling the opossum in your attic is figuring out how and why it got up there in the first place. It didn't just magically appear overnight; there's got to be an attractant up there and an entry point through which it made its way inside. Your job is to locate both of those things before you can focus on getting rid of the opossum. Otherwise, you're inviting more trouble right back into your attic! One of the easiest ways for opossums to gain access to an attic or a crawl space is through loose fascia boards. By sealing up all the possible entryways in your home, you're eliminating the methods an opossum can use to skirt its way inside. Check out the video below to see how this simple process can be accomplished yourself. Be sure to check the structure of your home (inside and out!) on a regular basis in order to make sure that everything is still standing in good order. This should be done as a routine Integrated Pest Management strategy. If you haven't already implemented this every few weeks, now is a good time to start! Here's a comprehensive checklist you can follow around your home to get started. If there are any holes or small openings in your home's structure or around windows, caulk them up immediately! Each unsealed hole presents an opportunity to become a point of entry for a small pest, or manipulated into a large entry point for an opossum, raccoon, rat, or mouse. By sealing up your home, you're closing all the doors to the outside—as they should be. This is a highly unpleasant task, but one that must be accomplished nonetheless. Sometimes, nuisance animals sneak upstairs totally unbeknownst to homeowners, then die—still under the radar. The only sign of their presence occurs when a scavenger appears to sniff out and consume the carcass. In this case, the opossum could very well be that scavenger. Because opossums regularly feast on dead animals when given the chance, it's not unusual for this to be a leading factor in their arrival. If an opossum smells a decaying carcass in an attic, it will make its way up there to pick the bones clean. And because the opossum eats the dead animal as it decays, this usually eliminates the putrid smell normally associated with carrion. Once you've found the issues that led the opossum inside your home in the first place, you can begin your efforts to drive it out of your residence once and for all. Take a look below at some of the best methods to ward off these nuisances and get your attic back! There are several oversized rodent traps and traps for nuisance animals on the market which can be used to confine opossums that have thrown down roots in your attic. These traps work using a system of springs attached to the door and the bait platform. Once an opossum crawls inside the trap to take the bait, the door will snap shut behind it, locking it inside. For our recommendations on top traps, be sure to check out our guide to opossum traps and cages. More often than not, nomadic opossums are simply looking for a place to crash for a few weeks. They like to make dens out of unorganized spaces because it's likely that they will be left alone in these places. If your attic is disorganized (and let's be honest, most attics are), opossums see this as prime real estate to settle down and spend a few weeks or months. By cleaning things up, you're removing the opportunity for the opossum to be left alone in its solitude. It will more than likely scurry away, as these animals are very shy and passive in nature. To further illustrate this point, check out how this opossum reacts when freed from a trap where it spent the night. The animal is so afraid of the human letting it go that it seems to be paralyzed! When all else fails, call someone trained to handle these animals. It may cost you a few extra bucks, but in the end, you'll be paying to have your opossum removed safely and securely. In addition to that, you'll get the peace of mind in knowing that your professional crew can offer you expert advice on how to prevent opossums from coming back in the future. While there are a ton of repellents and deterrents targeted toward opossums and other nuisance animals that you can purchase and use to sway these animals out, we DON'T recommend that you use them in your home, even in the attic. Well, these products usually employ an undesirable quality like aroma, sound, or light in order to drive off the opossums. For example: many repellents are made from the urine of predators, which is pungent. In the garden, this is no problem. In the attic, the smell wafts through the vents and within the entire home. Deterrents and repellents like ultrasonic repellers are effective, and maybe a little too much; we mention them here only as an option, but not one we wholly endorse for indoor use. It can be a little tricky to get the opossums out of the attic (and it definitely requires a few extra steps for success), but it can be done. The most important thing to remember is that the presence of these animals in the attic is often the first indication of a larger problem—an unsealed entry point somewhere, an unchecked food source out in the open, or both. 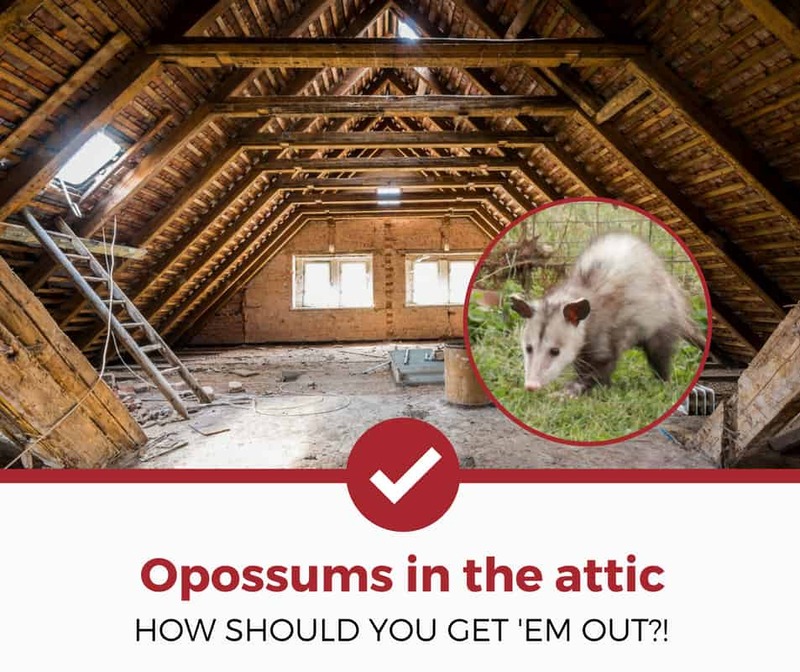 Make sure to locate these key aspects in your attic before driving the opossum out. In this way, the opossum is more like an alert to an issue than a nuisance animal! Curious about other opossum guides? Check out our other detailed guides to help you deal with your pest problems.